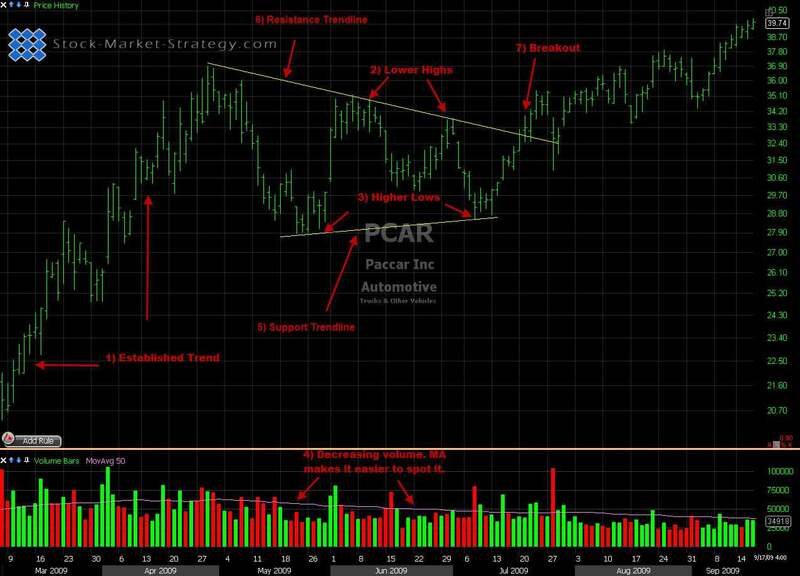 Symmetrical Triangle chart patterns are considered to be continuation patterns when conducting chart pattern analysis. Symmetrical Triangles can be taken to the long side or to the short side depending on the direction of the prior trend so it is particularly important to do an analysis on this chart pattern with extreme caution or with a confirmation trading plan tactic. Normally if the trend has come from the upside and formed the Symmetrical Triangle then you can consider the trend to continue up when the resistance has been broken. This is not to say that you can jump the gun because as with any other chart patterns you need confirmation of price breaks before the pattern is confirmed. The same has to be said if the price is coming from the down side and the Symmetrical Triangle is formed. This pattern does not vary in its development because it needs at least 2 higher lows and 2 lower highs. The trendlines will then have a point of reference to be drawn from to create the Triangle which is also the area that we call the support resistance area. You can quickly identify the Symmetrical Triangle when conducting your chart analysis with its distinctive wedge appearance. 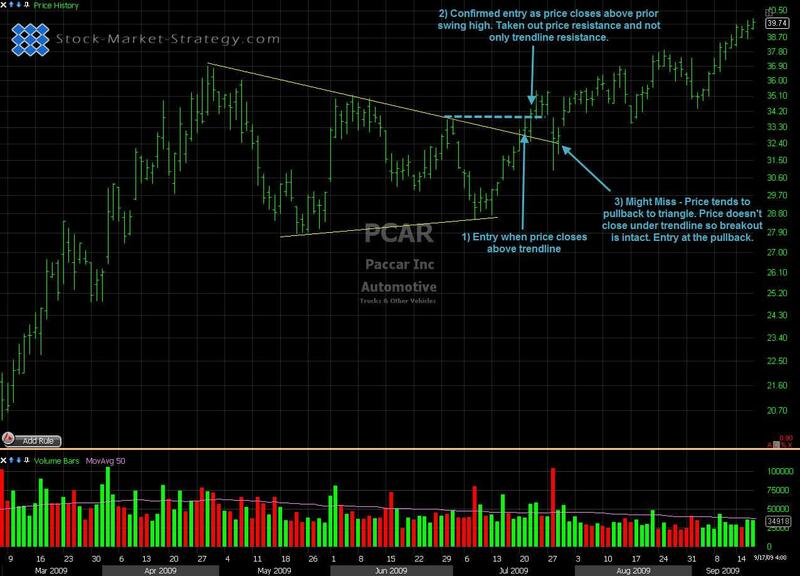 Like with any continuation pattern this is the period in the price action where the stock needs to take a break / consolidated before continuing on its prior trends journey. Establish Trend - As with any other continuation pattern there must be an established trend to continue. Symmetrical Triangles have to be formed after an established up or down trend. Lower Highs - After the trend has been established and price has started to make lower highs these are where we identify the positioning of the overhead trendline. For this to happen there must be at least 2 lower highs for reference points for the trendline to be drawn. Higher Lows - Now that we have 2 over head lower highs there must also be retracement levels which also require a minimum of 2 reference points for the trendline to be drawn. These higher lows give support to the price action and give the shape of the Symmetrical Triangle. Volume - What is noticeable with Symmetrical Triangles as the price range gets narrow the volume also decreases. 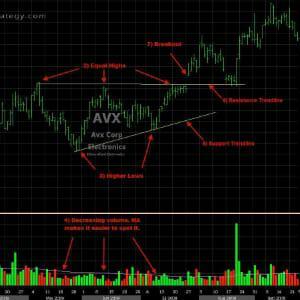 There are also characteristics that you should look of for with volume at the break out point. **Breakout Confirmation- A very important thing to remember is to only take the breakout if it occurs in the same direction as the trend prior to the pattern. This is because as previously mentioned it is a continuation pattern. For example, a breakdown in a symmetrical triangle in an uptrend could easily just turn into a flag/pennant resulting in the trader being caught on the wrong side. Confirmed Entry - Take out last swing pivot in the pattern. This is a confirmation trade and gives a later entry but it gives you more evidence you're the right side of the market.